Something a little different today... and not what I thought I'd write about here, but it's a message that I'd like to share. It's about the 'Insta-Perfect' world. The images that are the highlights, but not the whole story. The photos that are show our best side off, but forget the perfect imperfection of our everyday. So there are be gaps in our stories. Big gaps. The gaps that may well be the moments you want to remember in the future. The rainy days when we put waterproofs over their onesies, and pop to the alleyway near our house where the wheelie bins live, because the best puddles are there. The not-so-wooden toys that I put aside to take to the charity shop, but they are constantly re-discovered and enjoyed all over again. The perfect toddler sized hand-me-down Peppa Pig cups that the girls still love are very faded now and starting to look too small. These things are seemingly not worthy of capturing. But there's something real about them that I love. Drop me a line if you’d like to document some of your real moments in a Treasured Memories session, or if you’d like me to join you for a morning or afternoon! Newborn Family Photoshoot at home - for a Newborn Photographer!! I remember messaging an absolute rockstar maternity and newborn family photographer as a complete fangirl, telling her that her images took my breath away. 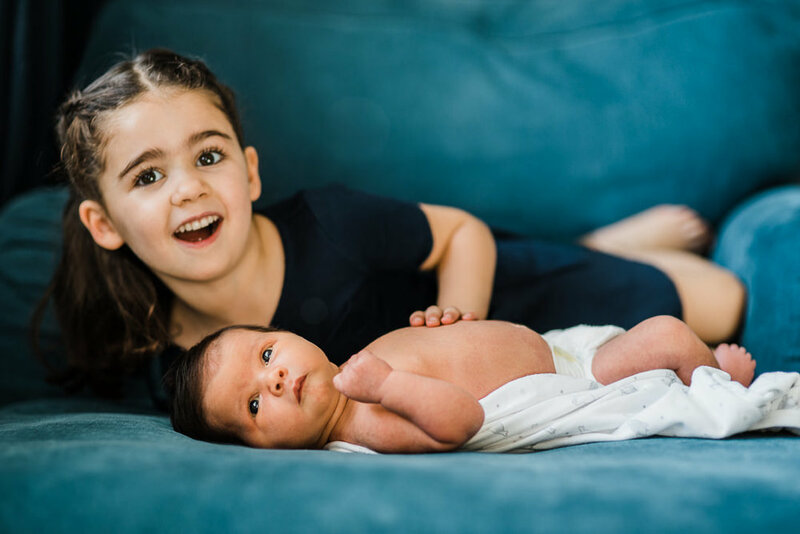 So when she asked me to take her own newborn family photos at her home, it was almost a quest for me - to take photos that I would have loved to have had, if I’d had the foresight to do this when my girls were babies. In fact I approach all of my newborn shoots in this way. I want to capture the memories of holding them, the way they look back at you, sharing that joy with your family, and just being present in those hazy early days. Because those memories are fuzzy and lovely, but many fuzzy… and they go in a flash. Which is why having photos of this time is precious, and becomes more precious as time goes on. It was important to me that I captured Jo with her family, as she is more than capable of taking all of the others! But I couldn't resist taking a few extras, as her baby is just so ridiculously adorable! I dare you to read this post and not feel even the teeniest bit broody!! I just adore this age - when every tiny thing is fascinating. When the edge of the bed is non-existent because you have these handy things called parents to catch you when you fall. Who needs a play gym, when Mummy hair is soooo much more fun? Or her nose, or Daddy's mouth for that matter... And the best seat of the house has just got to be in their arms, full of love and adoration. It was the perfect summer's day, and we spent the morning just relaxing at home, soaking it all in for a while. Every family has a different story. And that's what I love to capture. Which is why when I was asked if we could hold their family photoshoot at Stanway House, Cheltenham, where they got married - a place filled with wonderful memories, full of smiles and laughter (and a whole lot of rain), I said of course we should! So it was fitting that when given the option to reschedule, that they wanted the show to go on despite the drizzle! Victoria Warwick - I just loved the spirit of you and your family and the fun that you have together - it was an absolute joy to photograph! I hope you love your images!